The easiest way to avoid the dreaded “food envy” is to order and entire meal of small plates or appetizers to share. I’m never more satisfied than when I can have a little bit of everything on the table. This recipe for a homemade, healthier version of a favorite finger food is so tasty, you may not want to share. Crispy coating, right out of the oven. Preheat oven to 425 degrees and spray baking sheet with non-stick spray. Whisk egg in a medium bowl with 3 tablespoons of water, add flour to a separate bowl, and combine coconut, panko and almonds in another shallow, large bowl or plate. 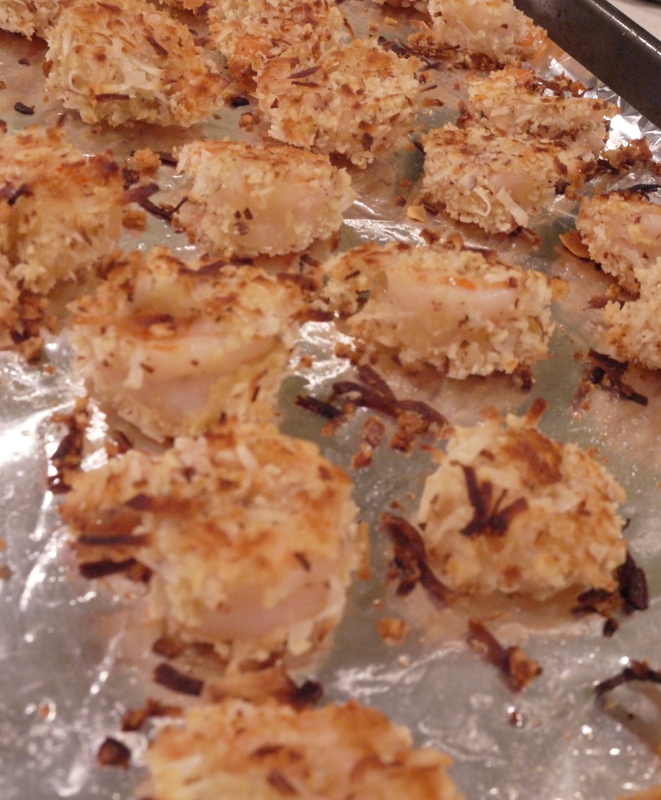 Season shrimp with salt, coat in flour, then egg, then coconut mixture, allowing ingredients to fully cover each piece. Place on baking sheet and bake in oven for about 10 minutes, flip and continue to bake for about 7 minutes, until shrimp are fully cooked. In a small sauce pan, heat apricot preserves, vinegar and chili garlic sauce over medium heat, constantly whisking until combined. 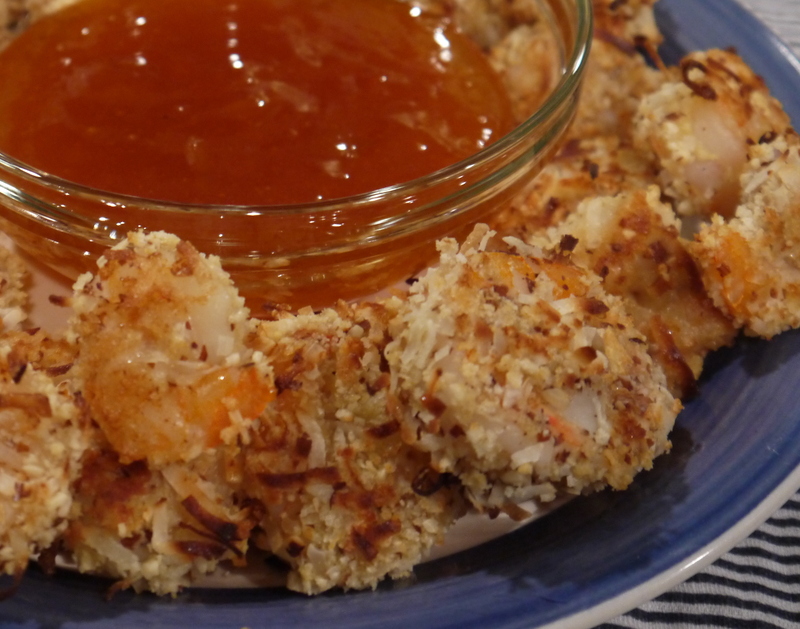 Place in a small bowl and serve with shrimp. This is a restaurant quality dish made at home and, while a tad bit high-maintenance (you may have a few dishes to do), it’s worth the effort. A crunchy coating of panko and almonds is accompanied by sweet, baked flakes of coconut. It’s pleasantly surprising how the breading maintains its crispiness with only a short stay in the oven; thanks to a coating of flour and egg before the coconut, you won’t have to worry about it falling off. The sweet dipping sauce, which has the slightest bit of heat, is the perfect accompaniment. 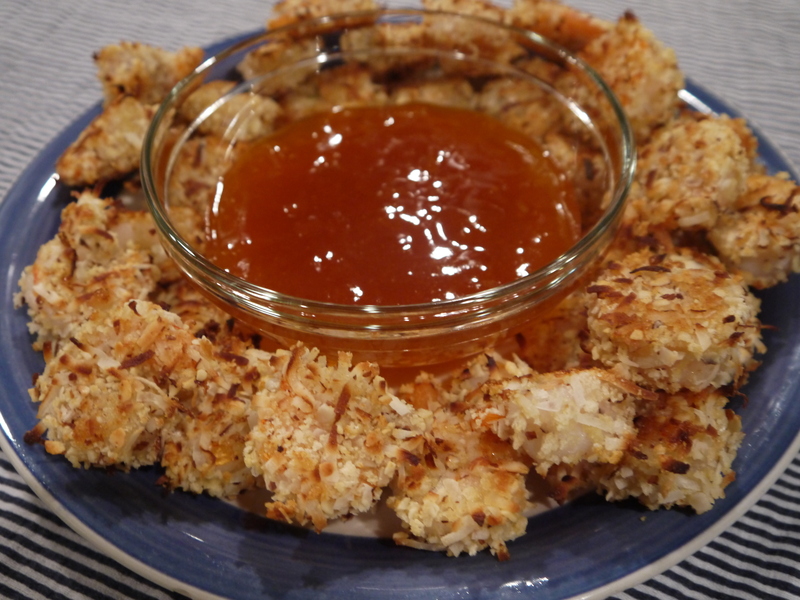 The combo of the coconut coating and apricot sauce would be perfect using chicken or salmon, as well. On second thought, you probably won’t want to share. ← The Weekend Digested, October 17 – 19: What D’jeet?